Well, at the very least T-Mobile is acknowledging the problem and attempting to at least provide basic troubl shooting steps to Nexus One customers suffering from 3G issues. While these steps seem to only provide the most basic of troubleshooting, at least they can help eliminate some of the confusion regarding handset swaps, whether or not HTC will assist in the situation, etc. While resetting the phone as Engadget points out can solve any number of problems it’s only a good first step. Certainly this looks like it will only be solved with a software update that needs to see Google step on the gas. Has anyone managed to solve the problem on their own? Sound off below. 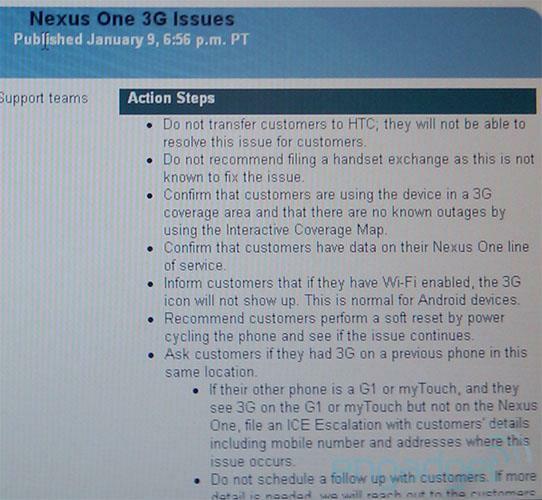 Google is really dropping the ball on the nexus one, regarding customer service! I do not understand why they would want to sit on such a sweet phone! if they would just sell it in freaking stores us sales reps and customer care could help the customer if they had problems. I am sure google doesn’t have to pay t-mobile to trouble shoot their phone if they would allow it in stores. But is it T-Mobile or Google not allowing the phone to be sold in stores? Haha I like how the first thing it says is to not transfer customers to HTC. They probably got pissed at t-mobile because so many people were calling them asking them questions they didn’t have answers to. I wonder if that means they don’t suspect a hardware issue at this point. If so that’s good news. Is it a success as far as sales numbers go? My friend has it and he has the 3G problem. He’s tried everything he can come up with and has been told by google/tmobile. No success. Guys and gals don’t be pissed at Google, TMO or HTC. Rest assured the issue is being fixed but there is nothing they can do immediately to get the 3G working if you have indeed narrowed down the issue to being the 3G issue (sim gets 3g just fine in G1 or mytouch). Give them time and hopefully this turns out to be a software problem that can be fixed via OTA rather than an equipment issue requiring you to ship them your phone first thus leaving you without a phone. It is not just a 3G issue. People are having trouble with 2G as well. The radio reception in weaker signal areas is terrible. It is even worse than the N900 and that is saying something. Like the N900, the signal is good in areas with medium to better signals. It is poor everywhere else. The odd one is even some in good signal areas are having bouncing 2G / 3G signals. If Google is approaching this as just a 3G issue, they will make the problem worse due to returns and people staying away from the device. I don’t know what 2G problem you might be talking about. It’s solely a 3g problem. EDGE Works more than fine on the phone. Lets not start spreading false rumors. The radio reception on my Nexus One is better than my Blackberry Pearl in all areas I’ve tried. I have no 3G problems whatsoever on my Nexus One. Three of my friends all have the Nexus One and suffer no 3G issues at all. I wonder if a bad batch of phones got sent out or if there is something different about the firmware in some of the phones. I have no 3G Problems with mine. I am getting better signal. I had a G1 and a MyTouch and got 2 – 3 bars in my house, where now I’m getting full signal now with my Nexus one. I have not had any problems with my Nexus. In fact has actually held a signal better than my friends mt3g. Give them some time a fix will come this doesn’t sound like something that can be fixed overnight. Although i must confess I am slightly disappointed by Google’s silence. I have not had any problems with my Nexus. In fact it has actually held a signal better than my friends mt3g. Give them some time a fix will come this doesn’t sound like something that can be fixed overnight. Although i must confess I am slightly disappointed by Google’s silence. Thank You Tmobile for at least trying. Perhaps it’s not a software or hardware issue? Perhaps the ever popular Nexus One is highlighting weaknesses in T-Mobile’s network? When it was just us we put up with it. For users coming from bigger carriers they might be underwhelmed and are spreading their anger as gospel over the web. The sad thing is that anyone can talk crap on internet boards. Mix in FUD from employees by other carriers and a whole mix of Apple fanboys, they can make a smaller issue appear like a HUGE issue. The media and blogsites everywhere are running with this notion. Just GOOGLE T-Mobile or Nexus One. I give T-Mobile props for adding new 3G areas as fast as they did, but I know at least in my area the deployment was hit or miss. Still one year later, they still have big gaps in their 3G serivce area with some sites still broadcasting GPRS or EDGE to this day. They need to activate 3G on more sites to add capacity and grow the 3G service area. just got my n1 today and my 3g is perfect. i’m in kansas city mo. i’ll be going to dallas next month for the nba all star game, so we will see how 3g acts on the road it there is not a ota update. You guys have to stop acting like this is a problem with all Nexus Ones everywhere. It sounds to me like it is definitely a bad batch as most of them work perfectly. This happens with all electronics as the manufacturing process is extremely delicate with semiconductors. I’ve seen 1 person out of 50 in my area where I work that have had this issue. That indicates it isn’t a network problem which some here think and it isn’t a problem with the actual phone…I say a bad batch were manufactured and shipped. I’ve seen this with EVERY single model of every phone T-Mobile has. I had to send back 6 brand new 9700 Bolds in one day because of software issues and they would not even get to the home screen. Got my Nexus last week and I’m not having the 3G problem here in Houston Texas. It’s weird because I had a Google Ion and the day I sold it to a friend I noticed I was getting a better signal than him? I think you guys and media should really report the fact that MOST of these phones are working perfectly fine. Download the anycut app, create a new shortcut, actions, phone info, go to the shortcut on the home screen, change from WCDMA preferred to WCDMA only this will lock the phone to 3g only…leave a 3g area and you will have to change it back, inconvenient but functional. Who knows what it is… my G1’s 3G was bouncing in and out from 3G to edge for weeks when they said Tmobile was planning for the 7.2 roll out. Its finally been doing pretty well although I still get the 2 bars one minute and all 4 the next. Also I noticed that my battery seems to be dying quicker. Maybe its because the network does seem a little faster or because of the fact that the bars go up and down. Who knows…. maybe they are going to release the 21 mbps speeds soon (highly unlikely) and that’s why the network has been acting up for everyone including the Nexus One users. Maybe the Nexus One can handle the 21 speed and they just didn’t spill the beans on it. As in the world of Google… maybe its all a test and your the “beta” tester. Who really knows… but hopefully this isn’t a hardware issue because it could end up effecting HTC (a hugh Android phone supplier for Tmobile) and Google. And Tmobile for that matter because it gives the nay sayers of Tmobile to say “see the network just couldn’t handle it”. To be honnest… if this is an HTC issue I think HTC needs to work on the quality of their products. I have owned a few HTC phones in my time… the Tmobile MDA being the first and while it was a good phone the paint started to chip off. Also on the G1 I’ve had issues with the screen and the squeeking which even on my 2nd phone is starting to do the same as before. Maybe if it is a hardware issue HTC will work on the quality of their work which I have discovered isn’t as good as it use to be. And while I myself haven’t actually played with the Nexus One… I am sure it has some flaws…. and this 3G issue may be one of them. Its also funny how the first reviews to even pop up about it were using at&t service so all they had for a signal was edge. You’d think they would have discovered this issue before the street date. Maybe Google already knew about it and figured either way they will be in the news “Why is the Google phone being delayed…. is it flawed?” Or “Google phone having 3G issues”. I guess its better to make money now than to lose it to the competition only to delay your product and expect people to buy it after it was found with problems. Then again people may not pick it up now until the issues are resolved… especially if they need to shell out $530 for it. And like with any electronics there is almost always some problem with it… and hopefully this one is software based. Otherwise I feel sorry for Google, HTC, and the people who bought it… oh and for Tmobile for having to deal with it even though they aren’t even able to sell it themselves. THE 3G ON MINES IS FINE! Here in Minneapolis.. 3G all the time, 5 bars, no problem! I LOVE MY N1 !!! @John you don’t even need anycut. Go to the dialer and hit: *#*#4636#*#*, then Phone Info, then Preferred network type -> change to WCDMA Only (as John mentions). See if it holds a connection then. I found this a while ago, when I was having 3g coverage issues in my area with my MT. Just remember these issues the next time a phone gets delayed. People hate delays, but this is much worse. pc world is stating first week sales of the nexus one were 20,000 units. they also stated those numbers may be high due the number of units given away to the media and google employees. if this is accurate than you would have to say the phone is being poorly received. when you know factor in all of the bad press they are receiving this could be a death sentence for this model. it may actually be easier for google to push out a different model in 90 days and use the normal retail channels with a better price point. i for one am glad that i purchased unlocked but even happier i returned it for a refund on monday. I wonder how many of these phones actually have this issue. I’ve had mine for a couple days now and (thank God) have no idea what this problem is all about. A few people post this on a blog and all of a sudden this is the worst phone/network ever. I love my Nexus and i haven’t had any reception problems/issues and i’m coming from verizon. Hey everyone, I just got my Nexus One (I had a MyTouch 3G as of yesterday) and noticed that my Nexus One was NOT getting the 3G signal at my house like my MT3G did. Anyways, I was messing around in the settings, under “Wireless & Network Settings” I went down to “Mobile Networks” then “Network Operators” then the phone searched, AT&T and T-Mobile came up, I think by default it was selected to set Automatically, but I clicked on T-Mobile as the preferred network, and BOOM, instant 3G like I normally had. Not sure if this is the fix, I kind of doubt it…but give it a try, might work for you if your having the problem. It comes with Tmobile selected as default. However, if it worked for you than that’s great. Is it really helpful to post here that you are not having problems with your Nexus One 3g signal? I’m sure you beleive those of us that are having serious 3g issues. But it is not helpful as Im sure Google, Tmo and HTC view theses posts. Any delay in resolving this issue really blows don’t throw a wrench into the works you are not helping!!! You don’t think it could be helpful for Google to know that not every handset is affected by this? I think it would help them troubleshoot. 3G on my N1 is slightly weaker on the outskirts of the 3G coverage zone, but certainly not like those complaining make it out to be. I love this device without any doubt, both beautiful and beyond fast, no regret ever getting it. Mine has been working pretty well too, but the 3G speeds are a little slow compared to my bro’s G1. Either way, I’d like to see a fix for the affected N1s. Someone from google posted in the google nexus one forum. He only stated they are aware of the problem. There no sure if it’s hardware or software. They would get back to us soon. In another post from this employee he stated the 14 day trial has not been changed? Basically continue to let the clock run out on returning the phone for a full refund. What a deal, assuming the cost of the phone is 175 dollars and they charge 45 dollars and get the phone back it’s a good deal for google. Why would anyone want to take the risk on google at this point. I would expect we will get another vague response on Monday to again string everyone along. I live in Phoenix area and get 3g sometimes. BUT My Nexus has spotty coverage and dropped calls every day on both 2g and 3g. Where as my Mytouch has way better reception on 2g and 3g at my house and around the Phoenix area. So I know its not just a 3g problem. Its a reception problem in general on my phone. So that means its a HTC and or Google problem. HTC made the phone but Google designed the hardware and software. So Idk maybe even android 2.1 could be the problem and not the hardware at all. That’s what I’m hoping for. But if I had to guess its probably the hardware on a lot of the nexus units. Maybe they cut corners to make it thinner and lighter? I only had the 3G problem once thus far in an area that my G1 also experienced the same problem. However, I am getting slower 3G speeds on N1 that I did not get on the G1. Still no HSPA 7.2 speeds and I’m in a solid 3G area.